The media have been abuzz lately about a desecration of a Philadelphia Jewish cemetery and a string of phoned in bomb threats. The bomb threats all turned out to be hoaxes, and nobody’s claimed responsibility for any of these things. There’s two things going on here. First is the fact that people are blaming Trump before anyone has claimed responsibility. For years now I’ve been following antisemitism – and it’s usually come from the left and from Muslims, very thinly veiled as anti-Zionism. I’ve seen a couple Trump tweeters blame the Jews for the media and the establishment left. But compared to spraying swastikas on Jewish fraternities after a BDS measure passes, it’s quite innocuous. And consider that the left does things like smear Trump over a bugged conversation 15 years ago, or smear Milo and Pewdiepie, or pass out Russian flags at CPAC and pretend it wasn’t a prank. With this in mind, and how quickly the left coordinated the blame on Trump, I wouldn’t put it past one of them to call in those threats. Second, I never heard of the Anne Frank Center till yesterday. I’ve written before about AstroTurf Jewish groups like J-Street and Jewish Voice for Peace (which is none of those three). And it seems the Anne Frank Center is no different. 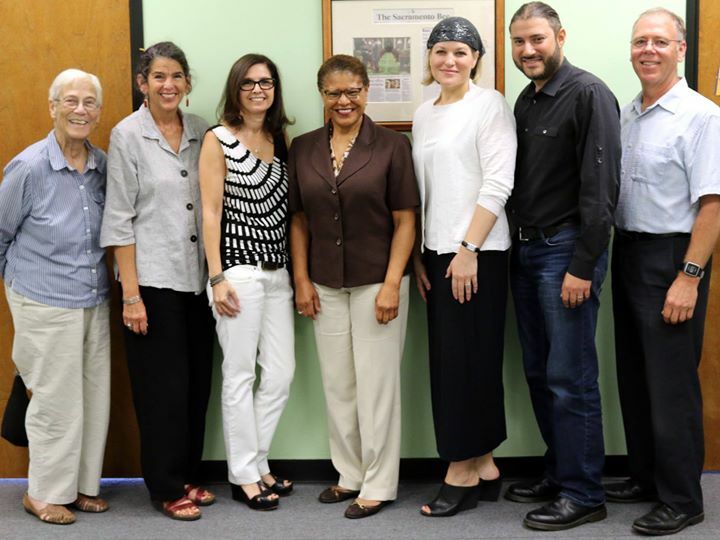 Karen Bass posing with Jewish Voice for Peace. Once I called her out that they’re very anti-Jew, she removed the photo from her FB feed. The thing is, any organization can name itself after Anne Frank, much to the chagrin of her family. The Daily Caller and Front Page both a great expose about how they were fluffed up from nothing. Elder of Ziyon also pointed out that they had no real role in any Holocaust remembrance. About the only journal not to jump on the Blame Trump for Everything We Don’t Like bandwagon was the National Review. They echo my concerns that the Gaza War of 2014 saw a major uptick in violence against Jews – to which the left just said “well it’s because you’re pro-Israel”. So for now, we only have conjecture to go by. What we have been seeing the past few weeks (months) is very coordinated attempts by very established and unscrupulous media to deliver a specific narrative. They’re in league with people who really don’t have an issue with committing violence against Jews, and they will stop at nothing to take down Trump. Groups that fit the narrative and provide them ammunition are elevated to national status. I smell a rat in all of this. And the Anne Frank Center is not exempt. Add them to the list of snakes in the grass.